What is Gratuity? | How to Calculate Gratuity? Home General What is Gratuity and How to Calculate Gratuity? Every Employee invests a lot of time and hard work to bring the company he is working to a great height. The employee and employer relationship is not just a work and pay relationship but it is a relationship that brings the company to experience all the highs and lows together. To show the employee their worth to the company and repay their service towards the company, the employer provides the employee with a gratuity. In this article, we will learn about what Gratuity and how to calculate Gratuity is using the gratuity formula and much more. Gratuity is the amount paid to the employee by the employer for the graceful service of the employee in the firm. It can be compared to the form of tip paid by the employer to the employee who is working in the company for more than 5 years. In India, the Gratuity Act was passed in the year 1975 which provided various rules and guidance of implementing the Gratuity Act all over the country to the workers of various sectors. This act benefited various workers that include workers in factories, mines, oilfields, plantations, ports, railway companies, shops or other establishments. The fund provided to the employee by the employer is sourced from the employer packet or the employer can participate in the insurance scheme that can provide the employee with the Gratuity amount. The insurance scheme is based on the clause in a group insurance scheme and the employee can also participate in this scheme along with the employer. Calculation of Gratuity amount is based on the number of year, the employee has served the company. The employee is only eligible for the gratuity amount when he has spent 5 years or more in the firm. As per the Gratuity Act, the amount cannot exceed Rs. 10 Lakhs anything higher than this amount is considered to be ex-gratia which is a voluntary contribution. 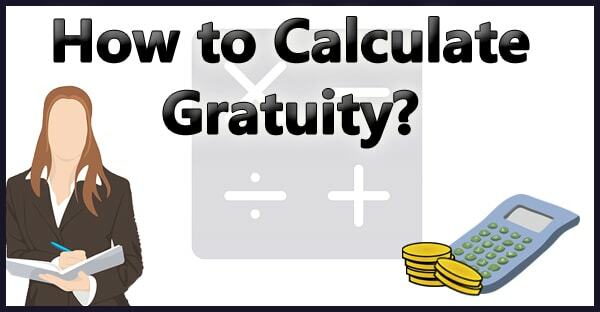 The formula or direction to calculate the Gratuity amount is provided below by replacing you details in the respective field will provide you with the amount that you are entitled to get as per the Gratuity Act. When it comes to the payment of the Gratuity to the employee any employer can pay whether the company comes into the Act or not. The payment of the gratuity includes basic pay, commission on sales, and dearness allowance. The following is the formula to calculate for the gratuity amount who are not covered under the gratuity act. For an Employee retiring from the service, the gratuity amount is equal to the one-fourth of the last-drawn basic salary of an employee for each completed 6 month period. The retirement gratuity amount which is payable is 16 times of the basic salary. However, it is subject to a maximum of Rs.20 lakh. 20 years or more Half of the basic salary for each completed six-monthly period. However, it is subject to a maximum of 33 times of the basic salary. Government employees working under Central Government or State Government are exempt of any taxes for Gratuity amount. For a salaried person, the gratuity amount of 15 days salary as per the last drawn salary of the individual is exempt from the taxes.